Yesterday was Labor Day in the US, and I let the fact that I should have been planning my menu slip right past me as I treated it like a day off and did something. . .unexpected. I've been binge watching Tiffany from Southern Gals Designs mixed media videos. I first found Tiffany when she worked primarily in beads and jewelry. While she still dabbles in that, she's been super-focused on mixed media art the last several months. Her videos inspired me to play with the medium so that's what I did most of yesterday. I'm pretty happy with the results these first tries. I'll admit that I took a lot of Tiffany's own techniques to heart. I do plan on checking out some other artists and techniques to learn more and develop my own style. It was a lot of fun breaking out of my bead/jewelry shackles. Tiffany's YouTube Channel just hit 300 subscribers so she's having a giveaway. There's only a few more days to enter. You can find the details on her Southern Gals Designs blog. I did finally get to the menu this morning. Here it is now. 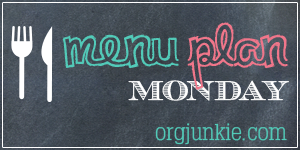 As always, I'm linking up to I'm an Organizing Junkie's Menu Plan Monday. Have you found any new creative outlets lately? I love your art. Very colorful and cheery. I never think to do something other than making jewelry, mostly because I do a lot of volunteering that usually includes making posters, crafts etc. This looks like fun. LOL -- I think it's great that you were able to find the time to be so creative! Those samples of your "playing around" are beautiful! Your menu plan looks yummy too. I plan my meals on Friday evening and then TRY to shop on Saturday but it doesn't always work that way. I love that you have been playing! I know it always helps my regular work when I try something new, it really frees you up! I love your mixed media creations, and that you were having so much fun you forgot menu planning! Jenna, There's something about creativity that breeds more creativity, I think. after 'playing' with the mixed media stuff, I was ready to get my hands in my beads right away, super motivated. I hope that trend continues. Thanks so much for taking the time to pop in! Oh my!! They came out great! I think these pieces would make lovely notecards! Love love love the colors!